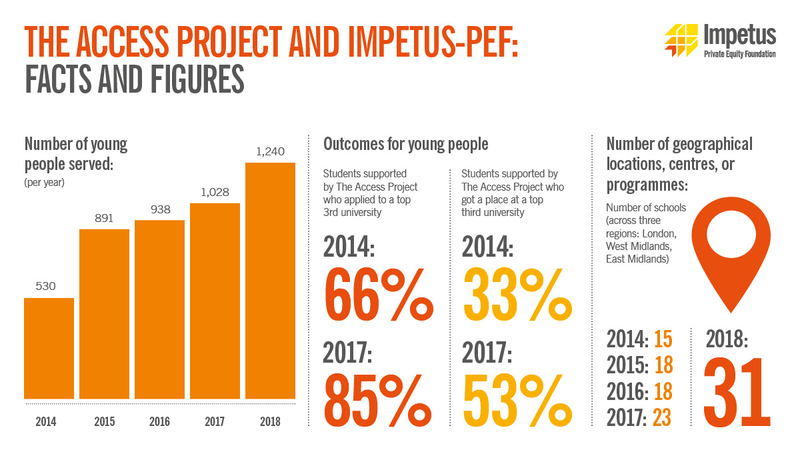 Impetus-PEF & The Access Project from Impetus-PEF on Vimeo. Our relationship with Impetus is by far the most serious and transformative. I’m proud we have built a culture around impact and using data to improve the delivery and design of our programmes. The need: Disadvantaged young people are significantly under-represented at top universities, making up only four per cent of the intake. Our charity partner: The Access Project works with high-potential students from disadvantaged backgrounds, providing tutoring and intensive support including mentoring, practice interviews and networking, to help them get into top universities. Our impact: Working with us, The Access Project now works in more schools, with more disadvantaged young people achieving the outcomes that matter. 56 per cent of their students were accepted to top tier universities in 2016, up from 30 per cent when we started working with them in 2014. We’ve also helped to strengthen their leadership team. The Access Project supports disadvantaged young people to get into university. PwC helped them assess their performance management requirements and translate this into the technical needs for the new IT system.